The main difference between API and framework in Java is that the Java API is an interface to a set of components that encapsulates functionalities while the framework is a set of classes, tools, and related components that help to develop the project. Java API is a set of subroutine definitions, communication protocols, and tools for building software. The usage and implementation of an API are included in its documentation. Framework in Java provides generic functionalities so that the programmer can change them and add them to the project. Using APIs and frameworks in Java project helps to build secure and efficient applications. An API stands for Application Programming Interface. An API in Java is a collection of prewritten packages, classes, and interfaces with their respective methods, fields, and constructors. Sometimes, it is required for a programmer to use certain technologies without much concern about internal implementations. API is useful in these situations. They make it easier for the developers to build applications by using predefined operations in APIs. There is more than 4500 APIs available in Java. One example of Java API is REST API. It is a web standard architecture and uses the HTTP protocol for data communication. It is commonly used for cloud services. Overall, API supports the development process. Furthermore, API will reduce the code length and improve the code reusability. They also help to access remote resources and are used for communication between services. Java framework is a collection of classes of predefined code that allows the developers to add them to their own programs to solve a problem. It provides the required functionalities to build and deploy an application. A Java framework provides functionalities as a part of a larger software platform. It can consist of support programs, compilers, code libraries, toolsets and APIs that support the development of the entire project. Framework is different from a usual library due to a number of reasons. Firstly, it provides inversion of control. This means the flow of the program is controlled by the framework. Secondly, a Java framework is extensible. Therefore, the programmer can extend the framework by overriding the methods or by adding specialized code that performs specific functionalities. Thirdly, there is a non-modifiable framework code. Therefore, programmers can extend the framework without changing the code. 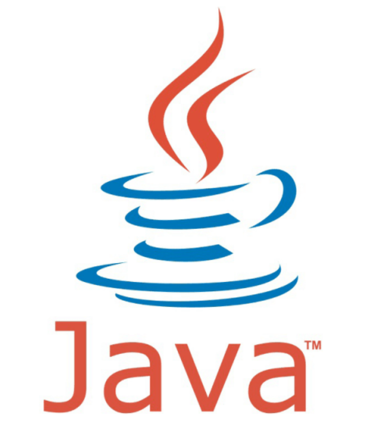 Overall, a Java framework provides multiple advantages. It increases efficiency and makes the application more secure. API in Java is a set of subroutine definitions, communication protocols, and tools for building software. Framework in Java is an abstraction in which software providing generic functionality can be selectively changed by additional user-written code, thus providing application specific software. The difference between API and Framework in Java is self-explanatory from this definition. Another difference between API and Framework in Java is that the API works as an interface between applications. But, Java Framework is used to design applications such as MVC web applications. They provide the model to develop the application. REST is an example for a Java API. Spring is an example for a Java framework. Both API and Framework in Java help to build robust applications. 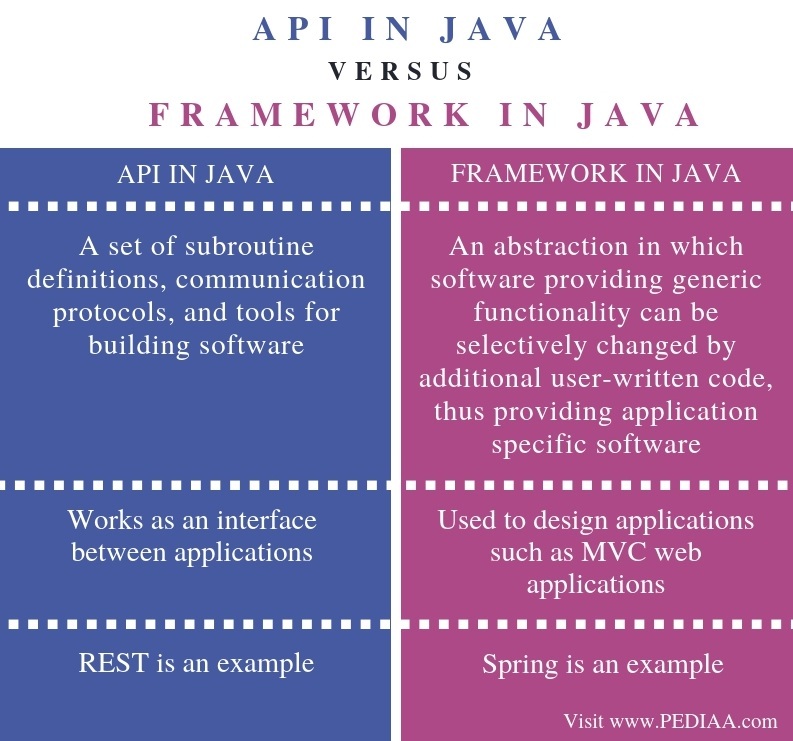 The difference between API and Framework in Java is that Java API is an interface to a set of components that encapsulates functionalities while a framework is a set of classes, tools, and related components that help to develop the project. 1. “Software Framework.” Wikipedia, Wikimedia Foundation, 9 Sept. 2018, Available here. 2. “Application Programming Interface.” Wikipedia, Wikimedia Foundation, 9 Sept. 2018, Available here.